December 2017 Windstar Lines closes out the year with 120 motorcoaches and buses and travels over 5 million miles this past year. A new record! October 2017 Windstar Lines purchases Showtime Tours of Las Vegas, NV motorcoach division and opens first location outside the Midwest. February 2017 Megabus, Windstar Lines partnership brings bus service back to area. August 2016 Windstar Lines purchases Rockford Charter Coach and moves Rochelle, IL location to Rockford. June 2016 Windstar Lines takes delivery of its 7th new 2016 Van Hool motorcoach. In an effort to continually provide the best service to our customers, Windstar Lines invests heavily in its fleet. A total of 10 new motorcoaches will be delivered to Windstar Lines for 2016. August 2015 Windstar Lines purchases Harms Charters of Sioux Falls, South Dakota. February 2015 Windstar Lines purchases a new facility for our Kansas City operations. December 2014 Windstar Lines closes out the year with close to 80 motorcoaches and buses and traveled over 3.6 million miles in 2014. August 2014 Windstar Lines earns the highest rating possible from DOT audit. June 2014 Windstar Lines takes delivery of the first of four brand new Van Hool TX motorcoaches. March 2014 Windstar Lines enters strategic partnership with Southwest Coaches of Prairie du Chien, WI. January 2014 Windstar Lines opens a branch in Kansas City, MO. July 2013 Windstar Lines takes delivery of a brand new 2013 mini bus. March 2013 Windstar Lines purchases a brand new 2013 Van Hool T-2145 motorcoach. August 2012 Windstar Lines, Inc signs agreement to purchase Dixon Meyers Bus Line of Rochelle, IL. February 2012 Windstar Lines is awarded the prestigious Vision Award from the United Motorcoach Association. February 2012 Windstar Lines acquires Stratton Charters from Cuba City, WI. September 2011 Windstar Lines receives the highest rating possible from Transportation Safety Exchange (TSX) Review. August 2011 Windstar Lines and the Iowa State Fair partner to offer the State Fair Express. April 2011 Windstar Lines takes delivery of 3 brand new motorcoaches. March 2011 Windstar Lines acquires Heartland Coach of Beatrice, NE. March 2011 Windstar Lines, Inc opens Lincoln, NE facility with agreement with Kincaid Coach Lines. January 2010 Windstar Lines takes delivery of another brand new motorcoach. December 2009 Windstar Lines receives another perfect rating from rigorous Department of Defense review. August 2009 Windstar Lines, Inc. signs Agreement to Acquire Bradley Jo Charter. May 2009 Windstar Lines is featured in National Bus Trader. November 2008 Windstar Lines takes delivery of a 2009 ABC M-1235. Windstar Lines, Inc. has taken delivery of an additional 29 passenger mid size coach from ABC Companies, based in Faribault, MN, bringing Windstar’s fleet to a total of 31 units. This 2009 M1235 coach has big coach features such as a restroom, DVD with a four monitor video system, large rear luggage compartment and a fine leatherette seating. Coach #044 will be assigned to the Des Moines Branch. September 2008 Windstar Lines provides 20 motorcoaches for the 2008 Republican Convention in Minneapolis. Windstar Lines, Inc. provided 20 motorcoaches for the 2008 Republican National Convention in Minneapolis. From August 30th through September 5th, nineteen of the coaches provided shuttle service for delegates across the country from various points around Minneapolis to the convention site at The Xcel Energy Center in downtown St Paul. A VIP coach from Windstar Lines was used as the dispatch center for officials organizing all transportation for the weeklong event. September 2008 Windstar Lines provides 13 motorcoaches for evacuations of Hurricane Ike. When Mother Nature called in the form of Hurricane Ike, Windstar Lines answered. Thirteen coaches returned back to Iowa from San Antonio, TX on September 21st – they have been in Texas being on call for evacuations, shuttling evacuees, military personnel, and state officials since September 7th for the State of Texas. August 2008 New home for Des Moines Terminal. Windstar Lines has purchased a building and large lot to become the permanent home for Windstar Lines’ Des Moines Terminal at 1967 Hull Ave.
June 2008 Windstar Lines purchases first wheel chair accessible coach. November 2007 Windstar Lines provided a daily shuttle for cancer patients from Carroll, Iowa to Omaha, NE. August 2007 Windstar sends thirteen buses to Texas in response to Hurricane Dean. August 2007 Windstar Lines provided over 165 motorcoaches for several candidates at the Republican Straw Poll held in Ames, Iowa. August 2007 Windstar Lines takes delivery of first mid size coach. April 2007 Windstar Lines installs Garmin GPS Navigation Systems in all coaches. May 2007 Windstar Lines Cedar Rapids Terminal completed. Windstar Lines moved into their new facility located near the Eastern Iowa Airport between Cedar Rapids and Iowa City this month. The new facility houses offices, two service bays, and a wash bay, and replaces the temporary facility which was located in Iowa City. January 2007 Windstar Lines acquires Huffman Coaches of Mason City, IA. September 2006 Windstar Lines purchases first VIP Coach. Windstar Lines purchases a former touring entertainer coach and has it converted to the “Super Coach” format by Vulcan Coach of Birmingham, AL. May 2006 Windstar Lines installs EZ Pass toll collection transponders in all coaches. March 2006 Windstar Lines Acquires Excel Executive Coaches. 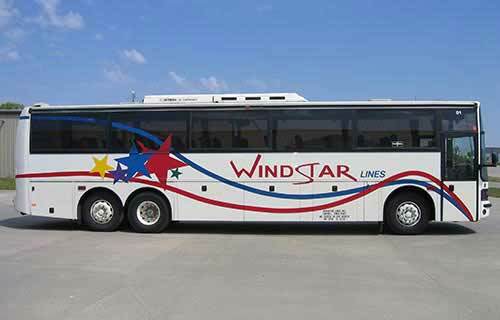 Windstar Lines purchases the assets and accounts of Excel Executive Coaches of Storm Lake, IA. The three coaches in Excel’s fleet have been sold, and the trips are being run out of the Carroll terminal. February 2006 Windstar Lines becomes Department of Defense Qualified. After a rigorous audit of our facility, equipment, and operations, Windstar Lines received a one rating (the highest rating given) by the military contractor Consolidated Safety Services, Inc.
October 2005 Windstar Lines outfits all coaches with DriveCam onboard vehicle video event recorders. Windstar Lines just finished installing onboard vehicle event recorders from DriveCam on all coaches to improve driver and passenger safety. For more information about DriveCam, please visit www.drivecam.com.